The recently concluded Heroes and Helmets Independence Day project, organised by Out of Nigeria (OON), an adventure and social good organisation, has been described as an ‘epic and uncomfortable challenge’ that moved Nigerians out of their comfort zones to engage with men and women of the armed forces in order to improve the relationship between civilians and people in uniform. 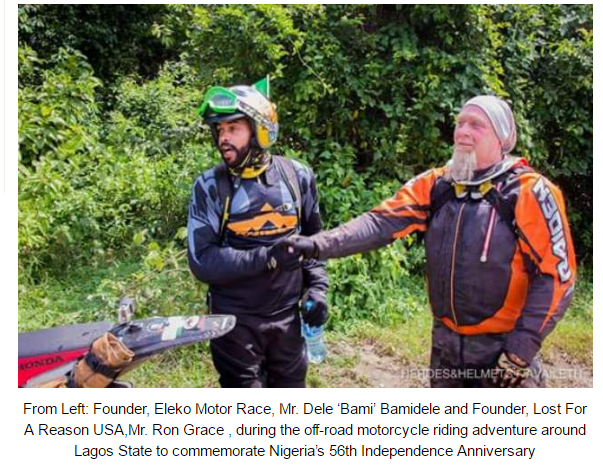 Founder of Out of Nigeria, Mr. Toyin Adebola, at the conclusion of the authentic Nigerian adventure dream that heralded the nation’s 56th Independence Day celebrations, said the Heroes and Helmets project was a historic two-legged event with an off-road motorcycle riding adventure around Lagos State by the Out of Nigeria team that included Dele “Bami” Bamidele, founder, Eleko Motor Race and Ron Grace, a bonafide off-road enthusiast and founder of Lost For A Reason, a charity that supports Native Americans in the United States of America. The off-road adventure took the riders through Tarkwa Bay, Badagry, Ikeja, Ikorodu, Epe, Eleko, Ajah and back to Victoria Island which was the bikers starting point.